I have green like tentacles growing out of the center of my sago palm. They look like long green fingers. It doesn't look like the male flower cone. What is this and can I cut them off? 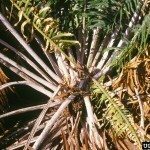 I think you are describing the new growth of leaves, this Cycad generally grows one set of new leaves each season.